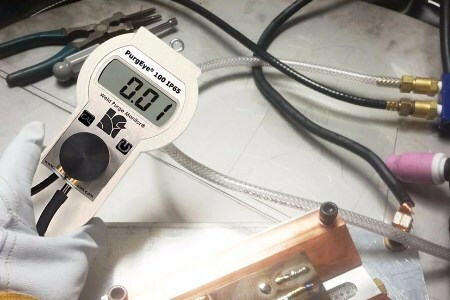 To ensure non-oxidised, zero colour welds are achieved when welding metals such as stainless, duplex and chrome steels, titanium and nickel alloys, a Weld Purge Monitor® (oxygen monitor) can be to measure the oxygen level before and during welding. The World Standard PurgEye® 100 IP65 weld purge monitor from Huntingdon Fusion Techniques (HFT®) is a low cost product that removes the requirements to fill entire tubes and pipes with expensive inert gas and avoids the need to guess when the oxygen level is low enough to begin welding. The PurgEye 100 is IP65 rated and comes with leak-tight push buttons, auto calibration features, vacuum-sealed leak-tight probe assembly, wrist/neck strap and tripod mount. Its extra long life sensor provides approximately 18 months life before it requires changing. A low sensor indicator will appear on the screen, warning that a new sensor is required. Once that icon appears, it provides the user with adequate time to obtain a new sensor, which can be fitted like changing a battery and the monitor can be re-calibrated easily by the user. The PurgEye 100 has a clear LCD screen with a 24 mm high display. When this monitor is not in use, an automatic sleep mode activates to conserve battery life.